Bran is the hard outer layer of a grain cereal, thus wheat bran simply means the outer shell of the wheat plant. Wheat bran is an excellent source of dietary fiber that helps mitigate the risk of various diseases and improves the body’s overall health. According to a Live Strong article, it is important to choose foods that are made from 100 percent wheat flour to reap the benefits of wheat bran, as white flour production normally removes the healthy outer shell of grain cereals during the manufacturing phase. Wheat bran is best known for its beneficial effects on both the cardiovascular and digestive profiles of the body. These plant byproducts are an excellent source of dietary fiber that facilitates digestion and bulks up stool, which in turn effectively relieves constipation, hemorrhoids, stool leakage, and other gastrointestinal disorders. Likewise, eating wheat bran is shown to promote satiety and mitigate hunger pangs for longer periods of time. This reduces appetite and food intake, which then leads to healthy weight loss. Thus, wheat bran makes for a perfect food fare against obesity and subsequent diabetes onset. Wheat bran may lower the odds of cardiovascular conditions, too. According to an article on the One How To website, wheat bran contains high levels of unsaturated fatty acids and dietary fiber that increase good cholesterol levels in the body. This results in lower blood pressure levels and slower progression of cardiovascular diseases. Eating wheat bran may slash the risk of heart disease and stroke. The beneficial cereal shells are also touted for their rich iron content. The ample supply of iron in wheat bran helps improve blood circulation and reduce the risk of anemia or iron deficiency. The plant product’s high iron levels are also essential for people who engage in strenuous physical activities and sports. First, the insoluble fiber in wheat bran is shown to dilute potential carcinogens and bulk up stool. Then, the plant product facilitates the digestive process and speeds up the elimination of these carcinogens through the stool. Lastly, the short-chain fatty acids in wheat bran induces a fermentation effect that inhibits the formation and growth of cancer. Wheat bran is especially beneficial in promoting heart health and maintaining a healthy digestive tract. Likewise, wheat bran may enhance the body’s strength and overall blood circulation. Wheat bran is primarily used in baked goods such as breads, muffins, and cookies. It is also a staple in many cereal mixes, energy bars, and multi-grain breakfast foods. In addition, wheat bran may serve as an extender to various meat recipes. 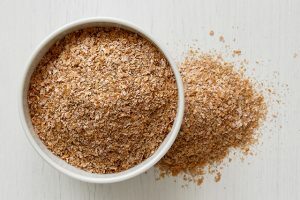 The Cookpad website has curated many interesting wheat bran recipes across the web. Wheat bran prevents colon cancer, heart disease, and stroke. Wheat bran staves off diabetes, obesity, and anemia. Wheat bran is beneficial to both the heart and the digestive tract. Wheat bran also supports the body’s overall blood circulation.